Whoa, buddy! Can you believe it's officially spring time!? Spring demo day is coming to Mt. Hood Meadows, the birds are chirping, the flowers are popping and the last issues of the shred rags are on the news stands. 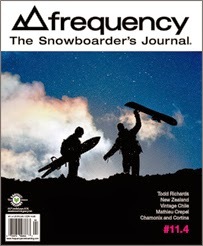 One of them, frequency: The Snowboarders' Journal even contains some of my own writing. It's true. I can't tell you what page it's on because I gave my only copy to my parents. They must be so proud. All of their other kids are engineers or parents or in the health care field. I'm the only one who gets paid to go to Japan, snowboard and write about it (more like go to Japan, snowboard and con-vince someone it's worth a couple bucks to write about it). Anyway, check it out if you're interested in little spots in faraway places that have deep pow and untouched tree stashes. Here's a story that got left on the cutting room floor, you know, word counts. I was on my way back from Mt. Hakkoda to my room for the night in Hirosaki. Buses and trains were all running late. I was waiting for my last train when I heard an overhead announcement that contained only one word that I understood, 'Hirosaki', then everyone around me slumped. I stood up, went up to a middle-aged gentleman and said, 'Is everything OK?' He laughed in my face. Google translate app to the rescue! A young woman, maybe high school age, also had a translating app on her phone and we pieced together that we were going to the same place. She got me to the right train, then to the right bus. In between we made broken small talk via phone translation. In all the jumping from train to bus and lugging my gear around, I didn't catch her name. She was wearing a camouflage parka with a fur-lined hood and the word 'AMAZING' printed all over it, so she will live on in my mind as 'Amazing Girl.' Wherever you are, Amazing Girl, thanks for getting me home that night.